Rogers Yahoo, which has repeatedly come under fire for traffic shaping, has now ventured even further away from neutral ground, by inserting usage messages into its users' unencrypted data streams. 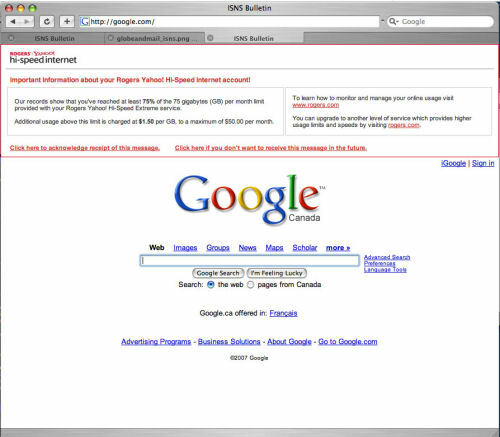 Made public over the weekend through Internet activist and co-founder of nonprofit People for Internet Responsibility Lauren Weinstein, someone going by the tag of "A Concerned Reader" captured an image of a Rogers Yahoo message being displayed over a Google Canada page. The message shows the bandwidth consumption of a Rogers user, warning that he is approaching his monthly 75 GB data cap. It is called Internet Subscriber Notification System (ISNS), and the ISP confirmed yesterday that it was, in fact, trying different ways to notify customers of bandwidth limitations. While the company says it is merely testing customer responses, it believes the information displayed in the ISNS message is useful to the customer. Rogers currently has no standard customer notification procedure of bandwidth limitations. But previous controversy for the company came also in the name of bandwidth conservation. Rogers is now well-known for throttling all encrypted traffic to keep Usenet and BitTorrent downloaders from consuming more bandwidth than everyone else. According to a Rogers customer survey, the typical customer consumes only 5 gigabytes a month. ISNS has been attributed to San Antonio network software developer Perftech, whose applications insert advertising, promotions, and subscriber care messaging into both wired and Wi-Fi environments. Perftech was a subsidiary of Canadian telecom giant Nortel until 2001. The actions of Rogers show how important the debate over net neutrality regulations has become in Canada. To sign petitions and receive updates on the state of Canadian internet laws, visitNet Neutrality Canada. Google's stance on net neutrality is that broadband carriers simply should not be allowed to use their market power to control the online activity of its users.